In September 2009, the Bulgarian lottery randomly selected 4, 15, 23, 24, 35 and 42 as its winning numbers. Precisely four days later, those exact same numbers were drawn again by the same lottery. Hand believes that this event was due to something called the “law of combinations,” in which each time a lottery result is drawn, there’s an increasing chance that it will contain the same numbers produced in any previous draw. The formula is n x (n –1)/2, if you’re interested. For this nauseatingly jolly piece, Suss Müsik explored the music of coincidence through forced combinations. The Bulgarian lottery provided the inputs; the numbers 4 and 15 were extracted to arrive at a 4/4 time signature in nine segments. The numbers 23 and 24 were added and multiplied by two to create a tempo of 94. The numbers 35 and 42 made a sum of 77. An electric guitar phrase was looped and sliced at key intervals according to the numbers: 5 second loops consisting of silent breaks at exact intervals: 1m10, 1m40, 1m50, 2m00, etc. 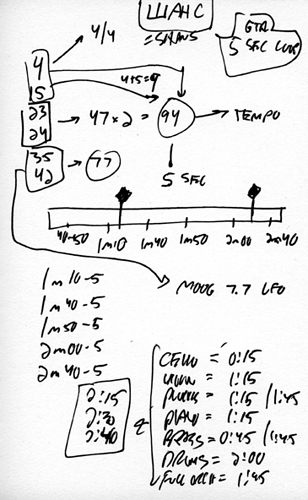 The softly modulating background are two Moog devices operating at an LFO of 7.7. The piece is titled Shans, which means “chance” in Bulgarian.